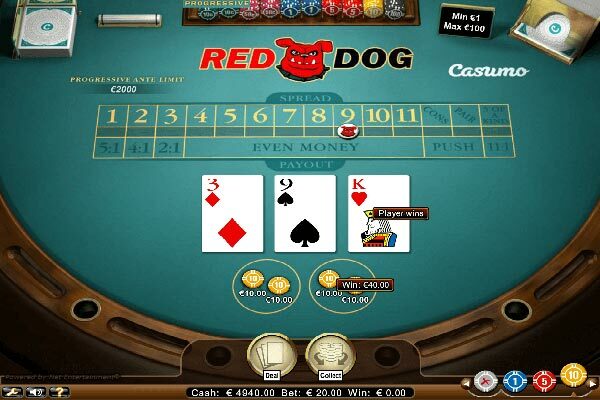 Red Dog is one of the simplest card games in a casino. It’s fast, easy to understand and doesn’t require any special skills. The game is played with a single deck of cards, which are shuffled after every deal so that previously played cards are of no benefit to future games. Players are dealt three cards, two drawn face up and the other face down. A winning hand is achieved when the face down card has a value that is in between the values of the other two cards. 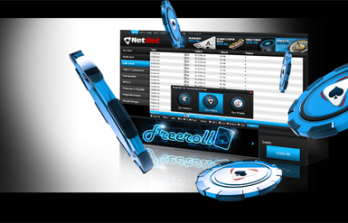 First, players must select the number of chips they wish to wager and then place them on the table. This is called the “Ante”. 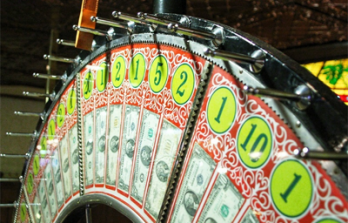 Each hand is played independently so wagers can be varied on each hand. Once the bet has been placed, the dealer will deal two cards, both face up. The third card must have a value that lies in between these two cards. The value of the cards is 2 through to Ace in ascending order, with an ace always being high. If the two cards are consecutive, it is therefore not possible to have a third card with a value in the middle. In the event of this happening, the hand is declared a push, with the stake being returned and the hand declared as over. If the two cards are of the same value, a third card is immediately dealt. If the third card is again of the same value, the player wins at odds of 11/1. If the third card is not of the same value, the hand is declared a push and the stake is again returned. 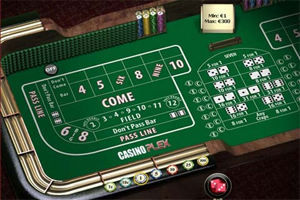 Players can decide whether to raise the stake or not. This happens if the two cards allow a third to be dealt which is valued in between the first two. The third card will be dealt face down, in between the first two which are already on the table. The likelihood of the third card having a value in between the other two is known as the spread. For example, if the cards dealt are valued at 3 and 5, then there is only one card (4) that can produce a winning hand, in this instance the spread is 1. If a player has raised the stake, the third card will be turned over, with the value revealed and players can see whether they’ve won or not.